An annual celebration dedicated to those who selflessly devote themselves to safe practice and safe care. This year, the Emergency Nurses Association continues to recognize the resourceful and masterful work of emergency nurses with a week-long celebration. Emergency Nurses Week is Oct. 8-14 and Emergency Nurses Day is Wednesday, Oct. 11. 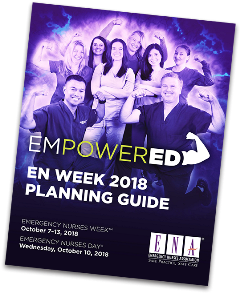 ENA encourages supporting emergency nursing throughout the week on social media using #ENWeek. The Emergency Nurses Week 2017 Planning Guide provides ideas and information on additional ways to celebrate each day of the week. Do you have an ENA Number and haven't registered on our website? It only takes a few minutes and you will gain access to all of the OKENA information and notices. Don't miss out and Register Today! Not an ENA Member? Check out all of the great Benefits you can get for being an Emergency Nurses Association member.